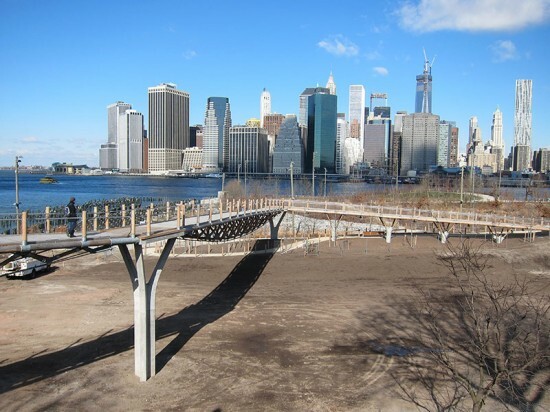 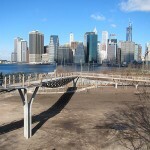 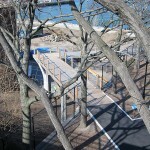 HNTB’s Squibb Park Pedestrian Bridge connecting the Brooklyn Heights Promenade with Brooklyn Bridge Park opened to the public last Thursday. 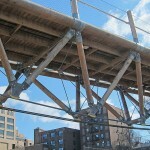 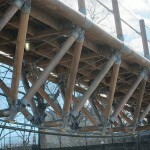 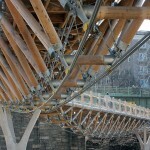 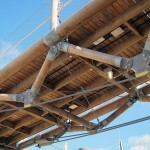 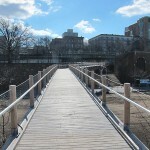 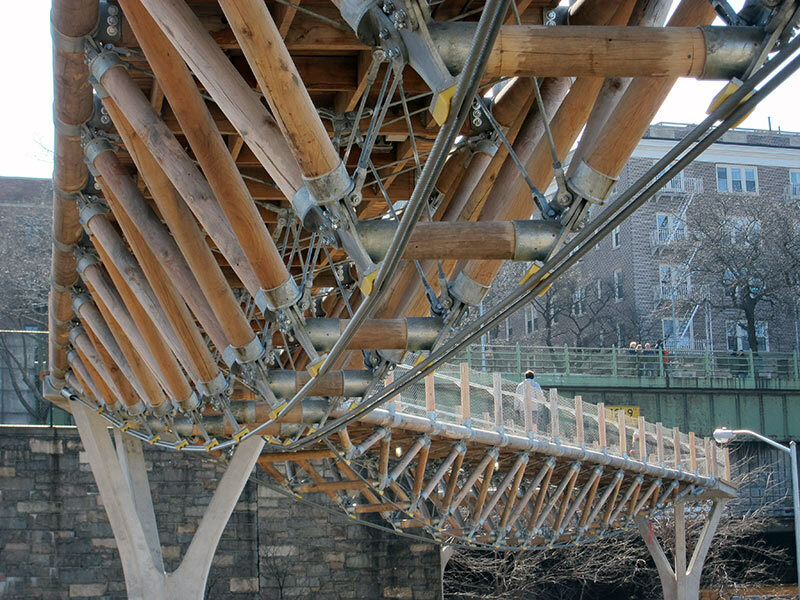 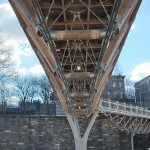 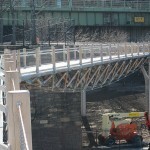 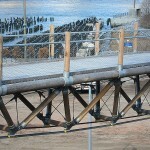 The $4.9 million bridge was built using “trail bridge technology” with galvanized steel cables and cylindrical black locust timbers, providing an efficient and lightweight structure that, as a sign at the entrance to the bridge warns, quite literally puts a bounce in visitors’ steps. 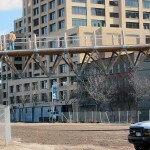 “The bridge is very light weight. 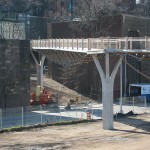 You will feel yourself walking across the bridge,” HNTB’s Chief Engineer Ted Zoli said at a construction tour in December. 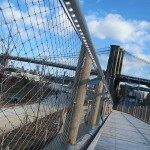 On AN‘s visit to the bridge Friday morning, traversing the spans did in fact provide a bouncy effect. 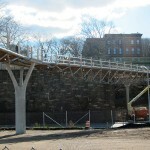 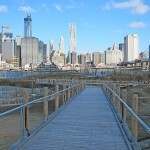 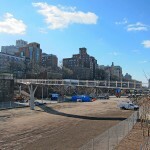 The 400-foot-long Squibb Park Pedestrian Bridge zig-zags through Brooklyn Bridge Park, moving through what will one day be a mixed-use development on the park‘s edge designed by Rogers Marvel Architects and providing a crucial connection to the Brooklyn Heights neighborhood which sits largely cut off from the waterfront by the Brooklyn-Queens Expressway. 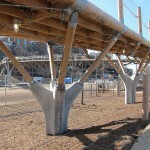 Concrete piers support the main bridge spans across Furman Street and through the park, which gently decline from a height of 50 feet to the waterfront park. 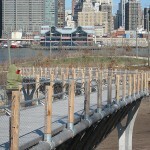 LED lights are incorporated into the handrails that will wash the pathway with light in the evening.